FerraPod means iron shell and is a grid design that can assume exactly the shapes you require. It is certified to Resistance Class 4 according to EN 1627 against burglary. It meets the requirements of those who are security conscious, whether it’s the protection of personal data or other items from pure physical theft or burglary. Each FerraPod grille or cage is designed with CAD and then laser cut to its specific dimensions. We then assemble the individual components on site – without welding (hot works) – which means that the installation does not need to affect your regular operation. FerraPod is assembled using a unique fastening system. Besides being safe and easy to install, FerraPod is also very flexible. Thanks to its modular construction, we can adjust it according to your premises. We can make openings and frames for doors, ventilation pipes and cable ladders anywhere in the design, and we can mount the door of your choice, according to your requirements and specifications. Vertical: Steel posts VKR, with steel core, mounted with 240 or max 270 mm cc to meet the requirements of the certification. Posts can be spaced together more tightly together depending on the conditions of the site. Horizontal: Steel axles mounted with 166 mm cc. Size: No limitation in constructional height or width, extension mounted after 3,000 mm in height. However, in order to rate RC4 according to EN 1627, the cage must be at least 3,000 mm high if it is freestanding. Design: Powder coated white steel as standard, but FerraPod is available in any color, even galvanized, VFR, for outdoor use. Opening: Can be placed anywhere in the design. Customer can choose available doors on the market as desired. Mounting: The cage is assembled using a fastener system, which excludes the necessity of hot work. 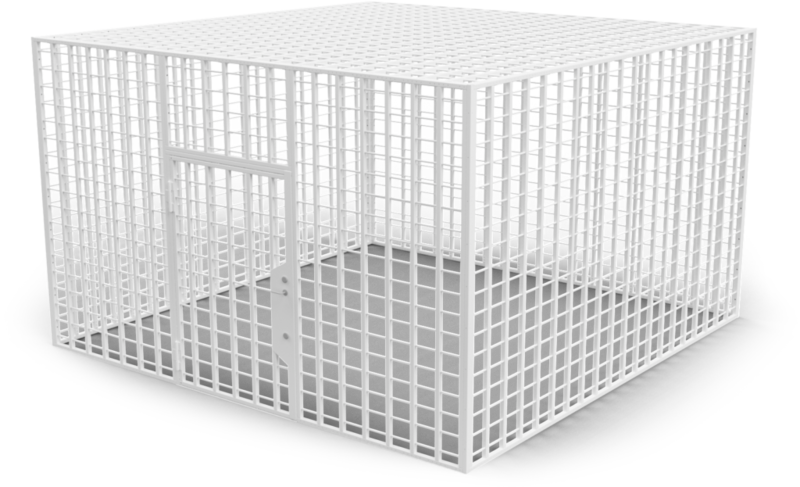 The ceiling of the cage can be mounted over the ceiling of the building and a grid floor under the floor, if desired. The steel posts can be fastened with feet in the floor and tops in the ceiling. The entire design is locked with a unique screw in each post. The cage can be dismantled and rebuilt. The FerraPod safety grating is tested by the Swedish Technical Research Institute (SP) and certified according to SS-EN 1627. It certified to Resistance Class 4. Below you will see the difference between the different classes. The burglary standard is based on various threat pictures and burglaries. In addition to practical burglary tests, other tests are carried out, such as pressure tests, for example, testing the rigidity of the grid and the strength of the specific details. Total test time * 15 min of which effective attack time 3 min. Intruders are expected to try to break through simple impact. Attack with smaller tools like screwdrivers (365 mm), hammer (145g), wedges etc. Total test time * 20 min of which effective attack time 5 min. Intruders are expected to try to break through using more severe force. Attack with multiple screwdrivers and crowbar (710 mm) in addition to the RC2 tools. Total test time * 30 min of which effective attack time 10 min. The intruder is prepared to take more risk and more time. Attack with saw, hammer, ax, chisels and battery powered drill in addition to the RC3 tools. Total test time * 40 min of which effective attack time 15 min. The intruder is prepared to take more risk and take more time. Attack with tools such as 125mm slice angle grinder, tensile saw, drill bit with carbide drill in addition to the RC3 tools. * Separating the total time and attack time in SS-EN 1627 allows the test person to pause to rest and think through the next step in the test.